Keep food of all kinds secure and safe for transportation or storage with bulk aluminum foil food wrap. Make sure to wrap pans and containers with tin foil to keep food fresh. 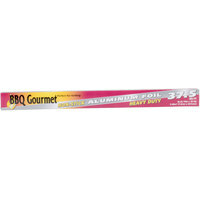 Purchase our selection of tin foil in either prepackaged foil sheets or by the roll. We also offer pop-up wax paper sheets, pizza boxes, and take out containers. Also make sure to check out other great items from Choice and Durable Packaging. Protect sandwiches, salads, meat dishes, leftovers, or to-go orders with aluminum foil from our selection of food wrap. Tin foil allows you to securely wrap all types of food, which allows food to stay fresh for longer. Our selection of food service foil comes in heavy duty or standard grade, making it ideal for restaurant kitchens or catering businesses who cook in bulk. If you're wondering where to buy durable packaging aluminum foil food wrap, we have a large selection of tin foil food wrap for sale at the lowest prices.